The first of four volumes by this prolific jazz band, this first volumes includes the rare Olympic recordings from 1923. Liner notes by Mike May, a dedicated OI5 researcher who has done extensive work in locating family of the band’s members. Tom Morton (d) dir. Johnny Sylvester (t), Vincent Grande (tb), Nick Vitalo (cl), Newman Fier (p). Note: This issue is credited to Manhattan Imperial Orchestra. As above; Tony Colucci (bjo). Benny Davis (v), accompanied by the Indiana Syncopaters. This side is included as a possible OI5 item. The personnel is unknown and may not be related to the OI5. Tom Morton (d) dir. Johnny Sylvester (t), Pete Pellizzi (tb), Nick Vitalo (cl,as), Harry Ford (p), possibly Tony Colucci (bjo). Johnny Sylvester (t) dir. Pete Pellizzi (tb), probably Nick Vitalo (cl), Harry Ford (p), possibly Tony Colucci (bjo), Tom Morton (d). 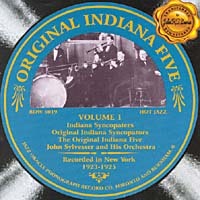 Note: The artist credit on this issue includes the subtitle “(Formerly Original Indiana Five)”. Same instrumentation, with some changes in personnel. Note: The artist credit on these issues is Hollywood Dance Orchestra. Tom Morton (d) dir. James Christie (t), Pete Pellizzi (tb), Nick Vitalo (cl,as), Harry Ford (p), possibly Tony Colucci (bjo).